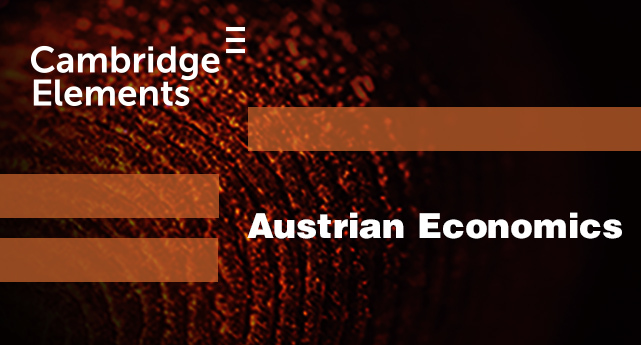 This Elements series is primarily be focused on contemporary developments in the Austrian School of Economics and its relevance to the methodological and analytical debates at the frontier of social science and humanities research, and the continuing relevance of the Austrian School of Economics for the practical affairs of public policy throughout the world. Peter J. Boettke is the editor of this series with Cambridge University Press. This interdisciplinary series promotes original theoretical and empirical research as well as integrative syntheses involving links between individual choice, institutions, and social outcomes. Contributions are welcome from across the social sciences, particularly in the areas where economic analysis is joined with other disciplines, such as comparative political economy, new institutional economics, and behavioral economics. Peter J. Boettke is the co-editor of this series, along with Timur Kuran (Duke University), with Cambridge University Press. This series aims to encourage scholarship in the intersection of the disciplines of politics, philosophy and economics. It has the ambitious purpose of reinvigorating political economy as a progressive force for understanding social and economic change. The series will be an important forum for the publication of new work analyzing the social world from a multi disciplinary perspective. With increased specialization (and professionalization) within universities, interdisciplinary work has become increasingly uncommon. Indeed, during the 20th century, the process of disciplinary specialization reduced the intersection between economics, philosophy and politics and impoverished our understanding of society. Modern economics in particular has become increasingly mathematical and largely ignores the role of institutions and the contribution of moral philosophy and politics. New Thinking in Political Economy will stimulate new work that will combine technical knowledge provided by the ‘dismal science’ and the wisdom gleaned from the serious study of the ‘worldly philosophy.’ The series will reinvigorate our understanding of the social world by encouraging a multidisciplinary approach to the challenges confronting society in the next century. Peter J. Boettke is the editor of this series with Edward Elgar Publishing. This series features the collected works of Israel M. Kirzner (New York University), a prominent economist of the Austrian school of political economy. Peter J. Boettke is the co-editor of this series, along with Frederic Sautet (Catholic University of America), with Liberty Fund, Inc.